Q: Can I vote here in Germany for the 2019 Elections? A: Yes, if you are a registered Filipino Overseas Voter in Germany. Q: How do I know if I am registered to vote? A: You are registered if your name appears in the Certified List of Overseas Voters (CLOV) in Germany. Q: Is it still possible for me to register as an Overseas Voter? A: The registration for Overseas Voting for the 2019 National Elections concluded last 30 September 2018. . This was intended to give COMELEC time to finalize the CLOV in preparation for the Elections. We will announce on our website and Facebook page when registration will open again for the next (2022) elections. Q: I was able to vote many years ago. How come my name is not in the CLOV? A: If you failed to vote in the last two (2) elections, your voter’s records will be deactivated and your name removed from the CLOV. You may apply to reactivate your records when the next registration period opens. Q: My name is in the CLOV. How do I vote? A: You will receive your COMELEC mailing packet in the mailing address you provided at the time of registration. The mailing packet will contain your ballot as well as instructions on how to accomplish it and send it back to the Embassy. Please make sure that you follow the instructions so your ballot will not be invalidated and your vote will be counted. Q: What if I have moved to a different address since I registered? A: Please let us know on or before 22 March 2019 your new mailing address using this form. When the registration period reopens, you will need to formally apply for a Change of Address so that your voter’s records can be updated. Q: Can I personally pick up my ballot from the Embassy and fill it up there? A: Yes, this would be possible, but please let us know by 25 March 2019 if you prefer to personally pick up your ballot so we do not mail it to you. To let us know, please send an e-mail to overseasvoting@philippine-embassy.de. Q: When is the period for Overseas Voting? A: Overseas Voting will take place from 13 April 2019 to 13 May 2019 (18:00h Philippine time, or 12:00h in Germany). You may receive your ballot before this and you may also send it back to us earlier than 13 April 2019 if you do so. Ballots received after 12:00h on 13 May 2019, however, will no longer be accepted. Q: What if I’m a registered voter but have changed to German citizenship? Can I still vote? A: If you have already given up your Philippine citizenship, you are no longer eligible to vote in the Elections. In case you still receive a ballot, please do not use it and let us know by e-mail at overseasvoting@philippine-embassy.de. Q: How can I make sure that my ballot and my vote will be counted? A: First, you have to make sure that we will receive your accomplished ballot. In recent months, we have observed problems in the local postal system with a number of mail being lost. If you are ready to invest a bit more to ensure that your completed ballot would reach us, kindly use registered mail or even courier, if you are unable to personally submit your ballot. Once the ballot reaches us, and if there are no grounds to invalidate it (eg. no signature of the voter), then you may rest assured that it will be counted. Q: Can I send or submit my ballot to the Philippine Consulate General in Frankfurt? A: Since Frankfurt PCG was only recently reopened, they were not yet factored into the planning and preparations for the 2019 Overseas Voting exercise. As much as possible, kindly send or submit your ballot directly to the Philippine Embassy in Berlin to ensure that we’ll receive it in time for the close of elections. Q: I have gotten married and changed my name since I registered so my name is now different from what appears in the CLOV. Can I still vote? A: As long as you are one and the same person and can prove it if required, you may still vote. However, once the registration period reopens, please apply to change your details so we can update your voter’s records. Q: How can I help ensure the success of the 2019 Elections? A: Please help us spread the word about the Overseas Voting here in Germany. Whether or not you are a registered voter, you can help by spreading awareness about this initiative. 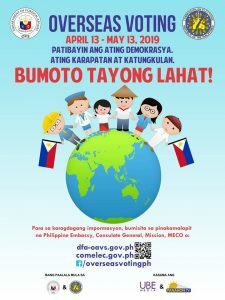 You may also share the advisories and announcements we regularly post on Facebook about the Elections and Overseas Voting. Q: I have other questions about Overseas Voting. Thank you and we hope you have found this Q&A helpful!